How do I charge the battery and view the battery power for my Galaxy Tab A? Your device is powered by a rechargeable, standard Li-Ion battery. A Wall/USB Charger (charging head and USB cable) is included with the device for charging the battery from any standard outlet. The battery comes partially charged. A fully discharged battery requires up to four hours of charge time. You can use the device while charging. Important: Use only Samsung-approved charging devices and batteries. Samsung accessories are designed to maximize battery life. Using other accessories may invalidate your warranty and may cause damage. 1 Insert the USB cable into the port. 2 Connect the USB cable to the charging head, and then plug the charging head into a standard outlet. 3 When charging is complete, unplug the charging head from the outlet and remove the USB cable from the device. Important: Failure to unplug the wall charger before you remove the battery can cause damage to the device. When the battery is weak and only a few minutes of operation remain, the device sounds a warning tone at regular intervals. In this condition, your device conserves its remaining battery power by dimming the screen. When the battery level becomes too low, the device automatically turns off. ► For a quick check of your battery level, view the battery charge indicator located in the upperright corner of your device’s display. A solid color ( ) indicates a full charge. You can also choose to display a percentage value. Viewing a percentage value can provide a better idea of the remaining charge on the battery. View how battery power is used for device activities. 1 From a Home screen, touch Apps > Settings . • Power saving mode: Touch ON/OFF to turn the feature on, and customize options. • Ultra power saving mode: Touch ON/OFF to turn the feature on. • Display battery percentage: Display the battery charge percentage next to the battery icon on the Status bar. The battery level displays as a percentage. The amount of time the battery has been used also displays. ► Touch the Battery chart to view History details. Battery usage displays in percentages per application. 1 Touch Screen, Android System, Android OS, or an app to view how they are affecting battery use. 2 Touch Refresh to update the listing. Note: Other applications may be running that affect battery use. 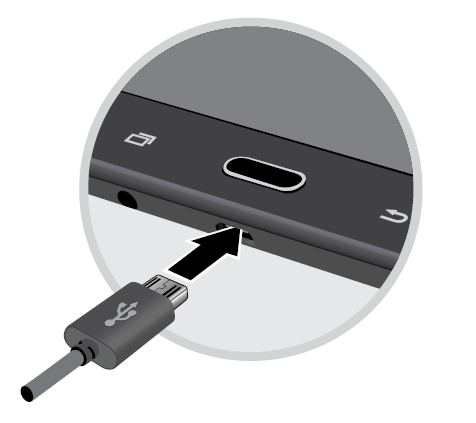 Galaxy View: How do I identify the correct charger for my Samsung Galaxy View? 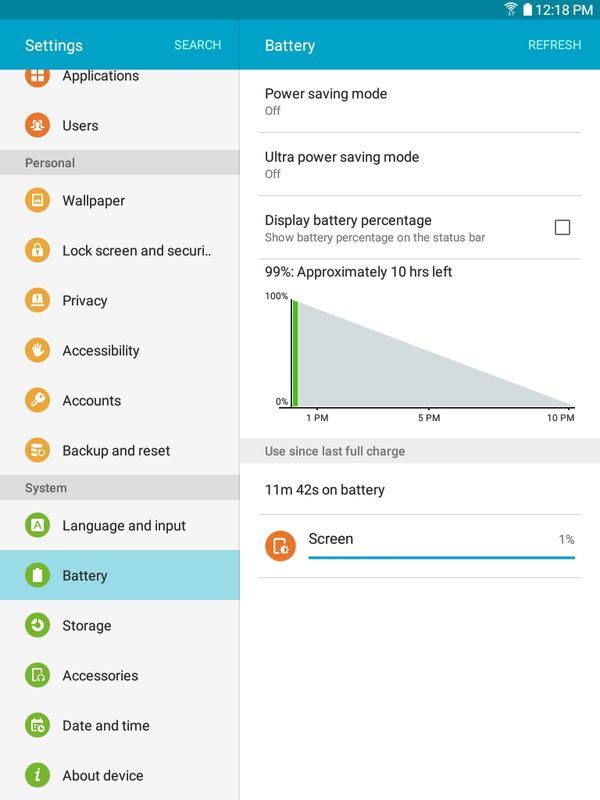 How do I monitor and extend battery life for my Galaxy Tab S3?